If you're interested in the high end of desktop multifunctional centers, the Brother MFC-8480DN is a great representation of what is out there. The unit costs more than lower grade models, but is packed with the a long list of heavy duty specifications and hardware features including both built in duplexing and networking. 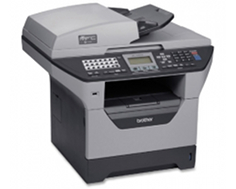 With a high print speed and great image quality, along with the full spectrum of scan, print, copy, and fax functions, you can't really go wrong with the Brother MFC-8480DN. Printing at a max speed of 32 pages per minute onto the letter sized format, the Brother MFC-8480DN is the absolute top of the line for a desktop unit. Though you will find higher print speeds in industrial grade copy machines and medium volume standup units, for a small MFC, this is as good as it gets for the most part. Print resolution is also excellent thanks to a true 1200 x 1200 dot per inch quality. While other devices rely on image enhancement to reach high resolution, the Brother MFC-8480DN depends only on pure hardware power. Standard memory is good as-is at 64 MBs, but expansion slots allow for upgrades all the way up to 576 MBs for optimal performance for those who often deal with complex print projects, such as mixed text and imagery, that rely heavily on the on board RAM. When an MFC runs in the price range of around four hundred dollars, one would expect it to offer businesses a few extra hardware flourishes, and the Brother MFC-8480DN delivers. This MFC comes complete with full networking abilities made accessible via an Ethernet port and automatic duplexing. Duplexing is essential for those wishing to produce clean, double sided output without user intervention, while wired Ethernet capabilities are perfect for those wishing to share the investment throughout the office if, for nothing else, to allow everyone access to the fax and PC fax abilities. For such a heavy duty unit, the 250 sheet paper tray is actually a little disappointing. A 50 sheet multipurpose tray is also included, but it still feels like, for the money, the overall paper storage of the device should be above 300 pages. The paper expansion option is also limited, as only one additional 250 sheet tray can be added. 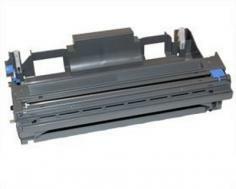 A unit that can print up to 30,000 pages per month maximum, and has a recommended monthly duty of 500 to 3,500 pages, should have, at least, the option of adding more paper storage. 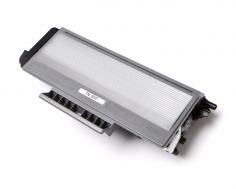 Review it: "Brother MFC-8480DN "
While the Brother OEM toner cartridge for the unit carries a 3,000 page yield and is quite expensive, third party manufacturers offer buyers a much more affordable solution. High yield toner cartridges for the Brother MFC-8480DN carry 8,000 page yields at 5% coverage and cost much less, cutting down on toner costs by about 70%, not to mention extending the replacement cycle to cut back on user downtime. The drum available is good for up to 20,000 pages as well.